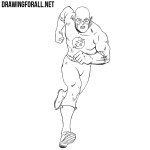 The artists of our site began their work in the art by drawing comic book characters. Most of all we loved the characters of the comics universes DC and Marvel. And now we are trying to teach our readers to draw the most different superheroes and supervillains. 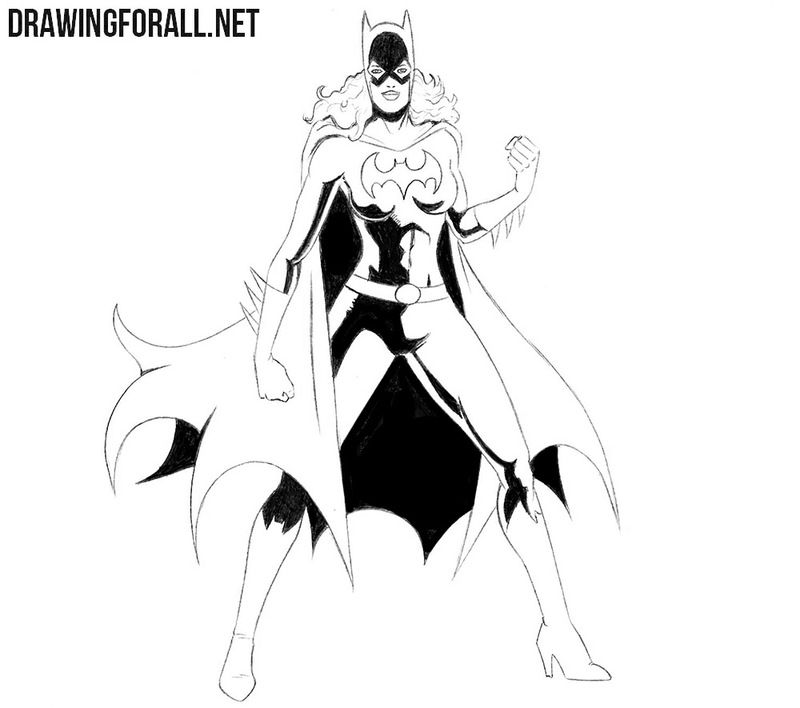 So today we will continue the theme of the comic book with this lesson on how to draw Batgirl. The beginning of the lesson will be very traditional, here we will draw the skeleton of a Batgirl. Let’s start with the head, sketching it in the form of a simple oval and the spine in the form of a simple line. On this line sketch out the outlines of the chest and pelvis. Using lines we sketch the arms and legs. Two intersecting lines on the head will help us draw the face. Next, the neck in the form of an oval, which smoothly turns into a torso, which narrows at the waist and expands at the hips. With the help of very simple geometric shapes we sketch the outlines of the legs and arms. 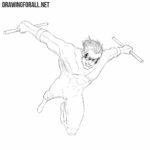 As you could understand, this step was needed to add a bit of volume to the figure of the superhero. 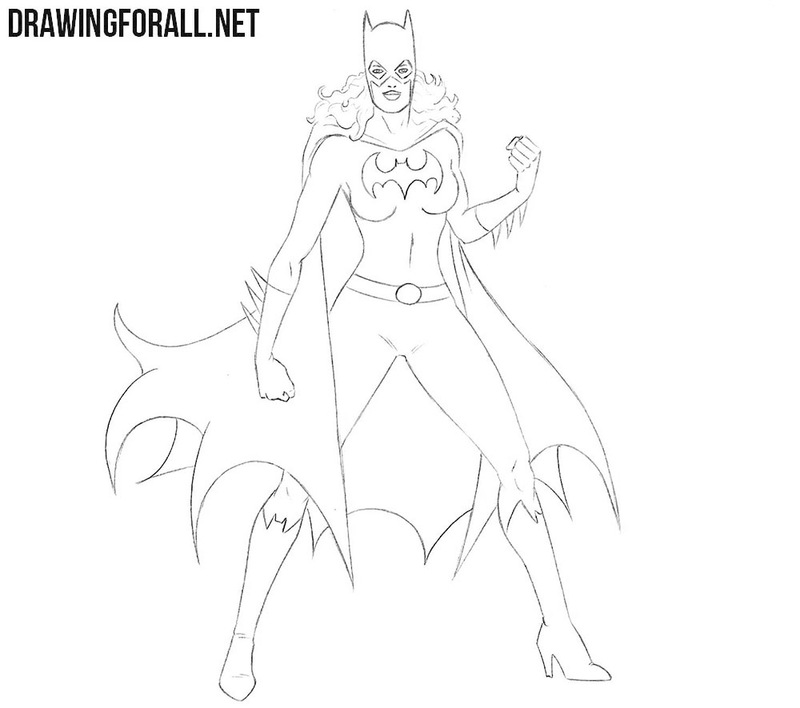 The third step of the lesson on how to draw Batgirl will also be very traditional, because here we will add the most basic details of the drawing. Let’s start with the head, outlining the details of the face and mask. Next, we outline the hair and a long cape behind the back. We conclude the step by sketching the logo on the chest and details of the costume. Details of the drawing we will draw using very dark and clear lines. And according to tradition, we start with the head, gently drawing the eyes, nose and mouth. Next, we draw out the outlines of the head and mask. Now take an eraser and remove all the unnecessary guidelines from the head of Batgirl. So let’s get down to drawing the torso of Batgirl. To begin with, we draw the outlines of the neck and long curly hair. Next, draw the outlines of the torso, taking into account all the curves of the body. 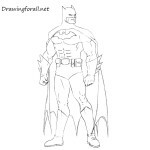 On the chest, carefully trace the logo and draw the upper part of the cape, which lies on the shoulders of the superhero. Now the arms, which will be drawn also with the help of clear and dark lines. Continuing the shoulder lines, we carefully draw the outlines of the arms, considering all the muscles under the costume. Next, draw the outlines of fists and details of gloves. 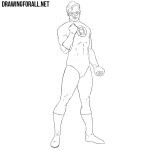 Remove all unnecessary guidelines from the arms of the superhero and move on to drawing the legs. 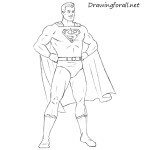 In this step we will draw out the legs of the superhero, but first of all we circle the lines of the long cape. 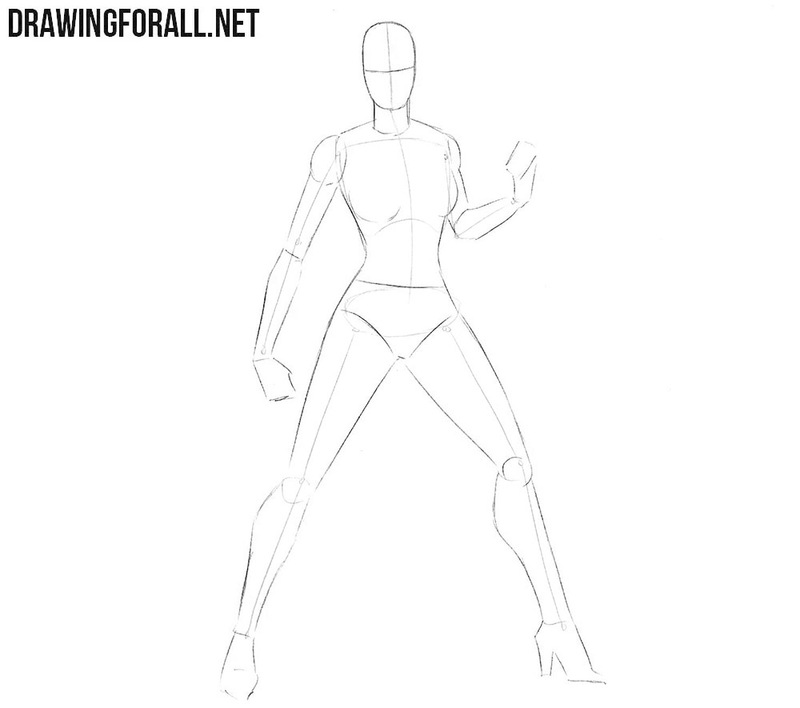 Next, continuing the line of the torso gently draw the hips and legs. 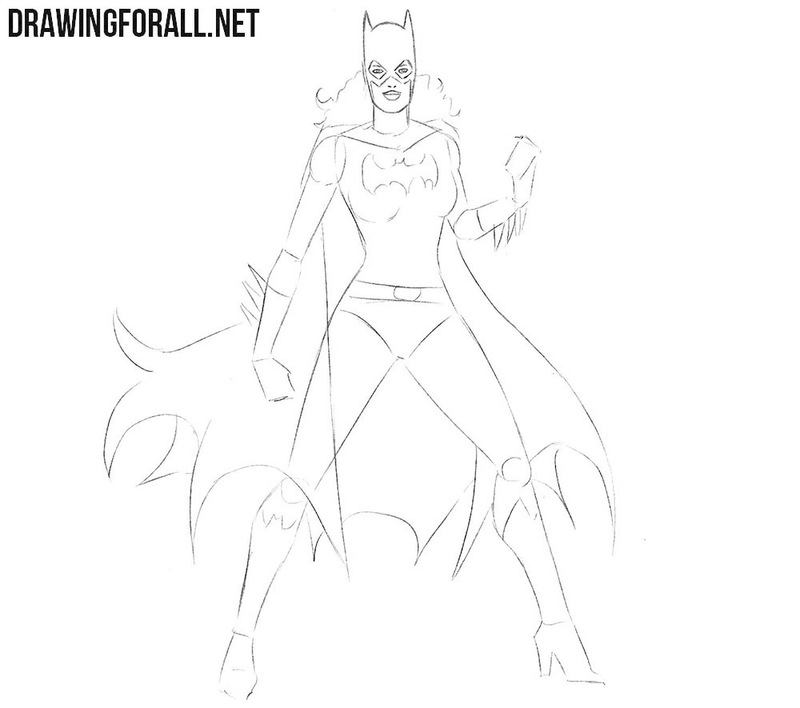 In the same step we draw the lines of the muscles and knee joints on the legs of Batgirl and erase all the unnecessary guidelines. In this tutorial, classic comic shadows will be applied, which should be dark and contrasting. In order to draw such shadows, we first outline the contours of the shadows, then simply paint them in solid black. In order to depict lighter shadows we will use simple hatching. This lesson on how to draw Batgirl replenished our collection of drawing lessons about characters from the DC Universe. 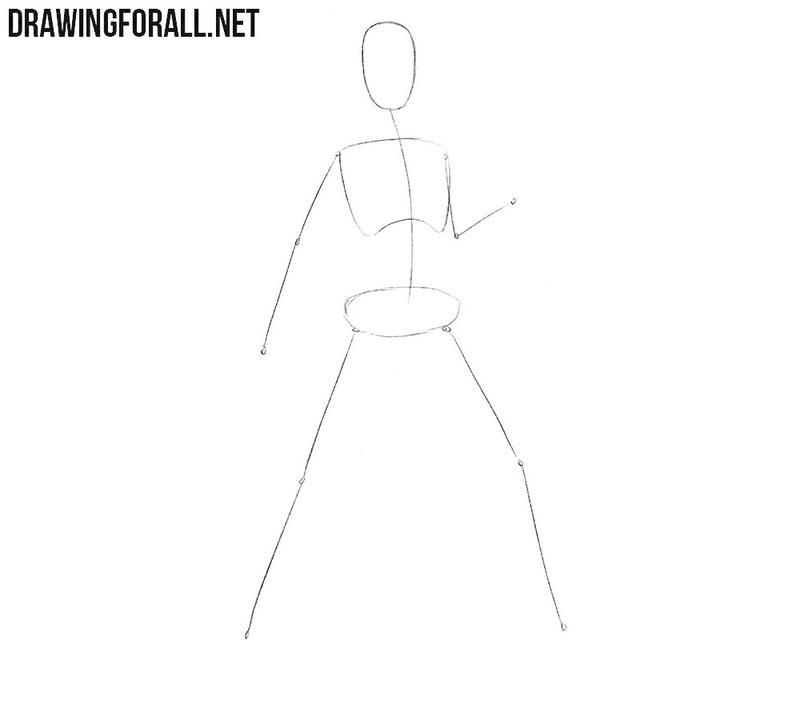 We very much hope that this drawing tutorial was very simple, and all of our readers could cope with it.